HISTORICAL ROMANCE REVIEW with Regan Walker: Best Western Historical Romances! Love historical romance? Well, you've come to the right place! This is a blog for avid readers (and authors) of historical romance. I started it to help other readers find the good ones...the keepers. In addition to authors guest blogging, I will share my reviews of those I've rated 4 and 5 stars, my favorite authors, my "best" lists and occasionally a special post. Come join us! 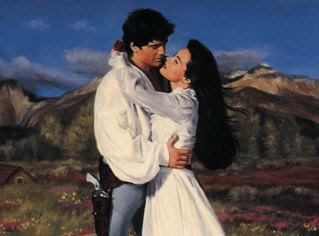 I first discovered Western romances by reading those written by my favorite authors who also wrote in other sub-genres (when I was gobbling up their backlists). Since then, I have become a true fan of the sub-genre and find myself every now and then reaching for a good romance from the Old West. So, it seemed a “best” list was in order to share some of these wonderful stories with you. Here are the best of those I’ve read…all rated 4, 4 and ½ or 5 stars by me. Some have won Golden Heart, RITA and other awards. I think you’ll like these! I don't see any books by Rosanne Bittner on your list. She is my all-time favorite. Have you read her books? "Thunder on the Plains" and her series "Savage Destiny" are books that I go back to when I want well-developed characters and a great story line. Hello Anonymous... No, I haven't read Rosanne Bittner but I'm putting her on my to read list. I'm pretty stacked up with requests and books for June, which is my Best Western month but I'll see what I can do. thanks for the recommendations! Rosanne Bittner is the best writer of western romance that I have had the pleasure of reading. None of the other authors even come close. Her Savage Destiny series books 1-7 are wonderful. Ms Brittner should receive more recognization than she does. If anyone can tell me of an author that they think even comes close to Ms Bittner, please suggest them to me. Thanks for the great endorsement. I'll put her on the to read list for June! I could not agree more. I've read thousands of western romance books and I, too, always go back to Rosanne Bittner if I'm looking for a well-written book. The stories are always exciting and the characters are always well-developed solid human beings. One of her best features if showing complete, devoted love between two characters as well as among extended family. The sacrifices they make for one another are extraordinary. My favorite of her books are mentioned above: "Thunder on the Plains" and the "Savage Destiny" series. There is a character in that series named "Zeke." I dare you to read that series and NOT continue to think about him for years to come. If you have not read any of her books, I highly recommend that you try one. It doesn't really matter which one you choose...they are all good. But, if you want to be truly impressed grab one of those that we mentioned above. Just call me "Anonymous 2." Annonymous, I note you are looking at an old version of my list. There is a newer one dated in June 2014. I will update it again this June when I turn to westerns. On my to read shelf for that month is Thunder on the Plains! Hi Reagen, The photo you have above was once on an inner cover of a western historical romance novel I used to own but can not remember the title of so I can hopefully repurchase it. I checked all the books on the above list but it wasn't among them. The story was about an Italian immigrant woman whose name was Rosa who moved west and opened up a restaurant and the local lawman falls in love with her. Can you tell me where you pulled the image from? Any information you can offer would be most appreciated. I'm sorry, Irena. I can't recall where I got the image. I didn't have the book and may not have even had the cover and the story doesn't sound familiar. Keep in touch by signing up for my author newsletter HERE. My book reviews are candid assessments of what I read and may not agree with all. While I post all my reviews on Amazon and Goodreads, I only post here those I've rated 4 or 5 stars. I try to provide useful information, series lists and my opinion on whether you would enjoy the story. I try to find the keepers--the ones you want to read and re-read. "A thrilling, edge of your seat, page-turner"
Winner of the RONE and #1 in Amazon's Top 100 Medieval Romances! Click to order on Amazon! Gold Medal Winner Illumination Awards! "A dazzling mix of passion, adventure, mystery and love"
"More passionate and more dangerous than it's predecessor"
“A salty, sweeping, evocative tale of romance on the high seas" And #1 in Sea Stories on Amazon! "Good storytelling, compelling plot and interesting characters"
"...goes best with some chocolates and a nice glass of wine." Nearly 1000 Reviews - 91% "Helpful"
See my article on The Allure of Medieval Romance! Click to see the article! A Top 55 Romance Book Blog! See me on Hometown Reads! April is Classics and Bodice Rippers month... historical romances you love to read and re-read. There will be two lists... How We Got to Where We Are Today and Best Bodice Rippers. So stay tuned! My Favorite Historical Romance Authors! Share book reviews and ratings with Regan, and even join a book club on Goodreads. NOTE: This blog claims no credit for any images posted on this site unless otherwise noted. Images on this blog are copyrighted to their owners. If there is an image appearing on this blog that belongs to you and do not wish for it appear on this site, please e-mail regan.walker123@gmail.com with a link to the image and it will be promptly removed.